Today is the Feast day of St. Maximilian Kolbe. It snuck up on me, it did. I know that his Feast day is August 14th, but I finish my Marian Consecration tomorrow and so I was focused on that instead of thinking about today. And yesterday as I sat at the kitchen table with Christine and mom and our calendars, hammering out what my next two months look like…it didn’t cross my mind. Some would say that I have a “devotion” to St. Maximilian Kolbe. In Catholic-speak that would mean that I find his life inspirational, that I ask him to pray for me, etc. This is true. I would say, however, that it’s more like St. Maximilian Kolbe has a devotion to me. This is crazy-talk, I know. But I stick to it. When I was a little girl my mother first told me about World War II and about the concentration camps. I could be wrong, but I wager it was because we just finished reading a “Molly” story from the American Girl Collection. My mother has given us countless things, and one of them is the gift of story from her many far-traveled adventures from her single life. We probably asked why Molly’s father was away fighting and she told us about the time she visited Auschwitz, one of the Nazi concentration camps. Stories of evil are not stories you can un-hear. After that, I tried to make up stories that would counter-act the stories of people poisoned in gas chambers, of the piles of shoes and hair that my mother saw…but I couldn’t. Dark evil exists. Years later, when I was a senior in high school, I went on my own adventure with my sister. We went to Poland and Germany. We saw the Pope, we made friends, we were exposed to the larger world. And we visited Auschwitz. I cannot type this without tears. One of the stories my mind always seemed to fall back upon is that the Nazis were small-scale evil, that only a few malicious people preyed on others. Auschwitz is a crushing reality to those suggestions. Well-documented photographs of every prisoner line the walls. The stone steps in the buildings are worn down in the middle from thousands of footsteps. A giant room of hair remains from the shaved prisoners, a giant room of the shoes of those waiting to be “interviewed for new job opportunities”…job opportunities that were lies. There is a map of all of Europe with the places of large Jewish communities linked by train tracks. Auschwitz was selected as a death camp after consideration; it would stream-line the killing since it was a centralized location. (God have mercy. Why was this a conversation anyone ever had…let alone the thousands who joined the Nazi ranks). There are documents of prisoner after prisoner—when they arrived and when they died (no one lasted longer than weeks). There are still empty bottles of concentrated poison dropped around the gas chamber floor. Auschwitz is a sickening reality. We were shown the ovens where prisoners were ordered to burn other gassed prisoners…after they had removed the dead prisoners’ golden teeth, that is. We were shown the wall where prisoners were lined up and shot. And we were shown the cells of “extra” punishment. Oh God. I feel like if I try to type this it will come out weaker than it needs to be in order to honor the men and women who were tortured. These were cells underground, in the dark. We had to walk downstairs to find them, cells where people would be left to starve and suffocate. In neighboring cells prisoners were forced up and down a series of obstacles that would place them in a tight closet-of-space. No windows. No ventilation. Packed with other prisoners. No one could sit or lie down. They were forced into these cells after days of hard labor, left to stand for the night, and then forced into hard labor again. In the midst of all of this there was a plaque. Around the plaque were flowers and candles. 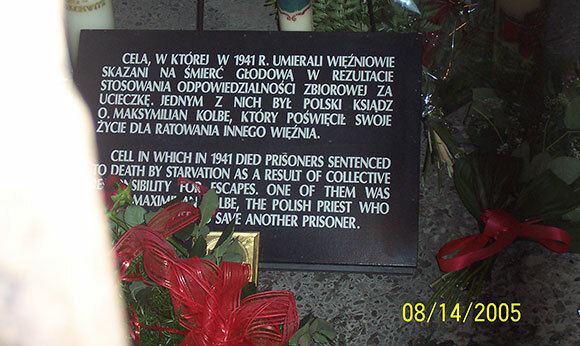 I read the English portion about the priest who was killed in one of the starvation cells. The plaque was behind a fence of sorts. That is how I first met St. Maximilian Kolbe. I met him via a plaque on his feast day in Auschwitz in 2005. Allow me to repeat that, because I think it’s interesting. I ended up in Auschwitz, at the cell of St. Maximilian Kolbe on his Feast Day without planning it. If there’s any theme that has come out of this Year of Faith for me, it’s the idea of a community of faith. We’re not here alone. We’re here with other people who prompt and prod and pull us towards heaven. That has been St. Maximilian Kolbe for me. St. Maximilian Kolbe: a light in darkness. The darkness of Auschwitz, the darkness of fallen culture, the darkness of doubt…and St. Maximilian Kolbe stands like a humble but rigid reminder of hope, faith, and Jesus. And I convinced my skeptical sister by pointing out that there would be PERPETUAL ADORATION if things were too miserable (I know how to sell, man). We went. 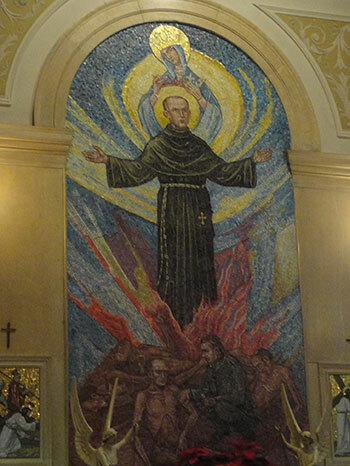 What that guy-at-mass forgot to mention was: it was a Franciscan retreat center (St. Francis is also my patron!). Score! Awesome people, incredible talks, refreshing spirituality. I’ve attended religiously every year since, friends. It was that good. Here I learned more about St. Maximilian Kolbe. He is patron of Communications, my major at the time (now my profession). He was a Franciscan (which scored points). And he had a gigantic devotion to Jesus…and Mary. We were welcome to “consecrate ourselves to Jesus-through-Mary” at the end of this retreat. There should be a post about my consecration—maybe there will be tomorrow—because it’s now a huge part of my life. But, this post is about St. Maximilian Kolbe. I was apprehensive about this prayer of consecration, but I also, somehow, felt like this man knew what was up when it came to holiness and…somehow…that he was my friend. So: I prayed my prayer of consecration. (But more on that later). What I’m saying is: St. Maximilian Kolbe was like, “We need people to be holy…fast. I think the surest way to do this is through a total consecration to Jesus-through-Mary” when he was alive. Somehow (honestly, I don’t know how Heaven works), he decided that I could use some extra assistance in the holiness department (DEAD RIGHT, KOLBE!) and somehow things were orchestrated so I met a guy at mass, listened to a guy at mass, went to a retreat held states away, and started another level of spirituality. The thing is, I don’t feel like we’re super buds or anything. I prefer devotions to other saints (St. Joseph, for one. St. Damian, as another). But, I still feel like St. Max is the one who has my back. I found a Franciscan church down the street from my work. I found a job in Communications. I found the strength to tough it out through challenging situations. A few months back an old coworker returned from a trip to Japan, bringing a holy card of St. Maximilian Kolbe with her. And he does, this intense saint of our century. He prays hard. I don’t get it. I can’t really respond. But I appreciate it. I appreciate your witness, I appreciate your never-ending support.